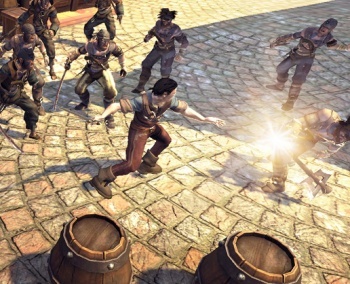 Lionhead boss Peter Molyneux says that the next Fable game will have features that will upset some people. Speaking with GameReactor at the Copenhagen Game Jam last weekend, Peter Molyneux revealed that his upcoming announcement about Fable 3 is going to cause some people to be very upset indeed. The question about the game turns up in the last minute of the interview, and the change in Molyneux is significant, becoming instantly cagey, and with the trepidation clear on his face says that "very, very big things are happening in Fable, bigger than you think," and that people will be "super pissed off" at the news. So what could it be that is going to upset people so much? In my opinion, it can go one of two ways. Either Lionhead is going all out with the social stuff it implemented in Fable 2, or it's going completely the other way and turning the social stuff right down, and making a pure fantasy adventure game. Either one will upset someone, but with Fable 3 confirmed as using Microsoft's motion controller Natal, it seems to lean more towards the former. Or perhaps Fable 3 will be eschewing a traditional controller altogether? That certainly would upset a lot of people, and makes a certain kind of sense, given Molyneux's evangelism for the device. Either way, we're going to have to wait until the announcement at Microsoft's X10 event later in the month.